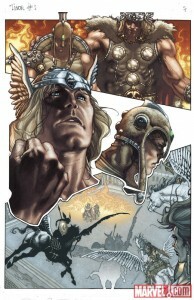 Beginning an epic adventure showcasing the God of Thunder as you’ve never seen him before! 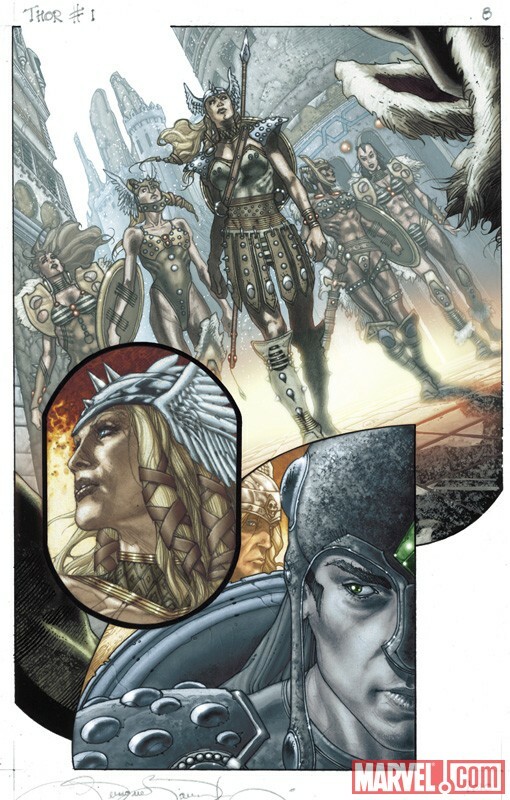 The vassals of Asgard are in armed revolt…Odin is missing…Balder is dead…and the entire continent is battered by a years-long winter. How can Thor put the empire back together, especially with his mighty hammer Mjolnir mysteriously denied him? 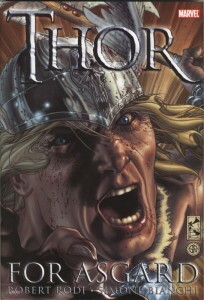 Collecting THOR: FOR ASGARD #1-6. I’m going to dispense with the criticism right away: Robert Rodi’s story is full of holes and doesn’t feel complete. We start with not enough information and end with few resolutions: it seems we have the middle with beginning or ending. Bad things are happening in the nine realms but we don’t learn about why or how. Thor is ruling while Odin seeks one of his wives and there’s strife between the gods, leading us to a realization that those in charge need to provide for all their people. No character development but decent dialogue and a plot I enjoyed, what their was of it. In its oversized 7.5×11″ hardcover format Thor: For Asgard is all about Simone Bianchi’s artwork. It is stunning: lively, detailed, beautiful. I couldn’t stop admiring Odin’s hair and beard; it’s that intense. Inks and colours are a bit soft but they’re consistent and a creative choice. Panel layout is very dynamic; lots of interesting choices like those above. At $25 for 144 pages I’m on the fence about this book’s value: weak story and strong art. For extras we get a one page Thor movie poster, my first add in a collected edition, and a three page article about Rodi which reads like an ad for Thor & Loki: Blood Brothers and Astonishing Thor.